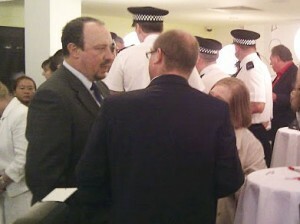 RAFA BENITEZ and his wife Montse were at Hotel Indigo in Liverpool yesterday for the official launch of the Montse Benitez foundation. The couple moved to Merseyside in 2004 when Rafa became the Liverpool manager and seven years later they class the area as their home. They were uprooted for a short time when Rafa took the Inter Milan job following his departure from Anfield but Montse and the girls (they have two daughters) were homesick and it wasn’t Spain they were missing. When that role came to a premature end it would have been a relief to the females of the house at least. The two girls are now back at school with their friends, Montse is back near the people she has grown close to during their time here and the West Kirby based Benitez household is all smiles. That includes Rafa. It’s clear that as much as Rafa misses the day-to-day involvement of being in charge of a club he’s in no hurry to get another job as a manager – he’ll wait for the right job to come up. He wants to work in the Premier League and he wants to work at a club that shares his vision and wants to work with him, not against him. In the meantime he’s keeping himself busy with the launch of his own website – rafabenitez.com – a role on Eurosport and the foundation set up in his wife’s name. Montse said the foundation would help a range of organisations both in terms of bringing in funding and raising the profiles of those groups. This is something they had already been doing during their time in England, making personal donations and helping to publicise causes like Arrowe Park Hospital, the British Heart Foundation, Children with Leukaemia, HFSG, Liverpool Women’s Hospital and more. It’s a long list, but now under the banner of the Montse Benitez Foundation their efforts will be more co–ordinated and more effective. Mrs Benitez also told the gathering a little bit about why they set the foundation up and why it’s focussed on causes close to the place they call home: “Since I started talking about setting up a foundation a question everyone was asking was: ‘Why? Why a Foundation and why Merseyside?’ The answer was quite simple. The focus will be on charities which are small and completely independent and applications are encouraged via the website. Liam Harker was a Liverpool supporter from the North East who died aged 17 from a rare form of stomach cancer. His battle against the disease was an inspiration to Liverpool fans, staff and players – he had a banner made and raised in his honour on The Kop, in front of the TV cameras, and was sent a shirt signed by Rafa Benitez and the squad. Rafa invited him to Melwood to see the players train but sadly Liam wasn’t well enough to make the journey down to Liverpool. Liam died on May 5th 2008 but the awareness that came from the large amount of publicity of his plight has helped later sufferers of the disease. The Liam Harker Memorial Fund was set up in his honour, proceeds of which go to NECCR, the North of England Children’s Cancer Research Fund, based in the area Liam came from with the aim of raising money to continue research into the causes and treatment of childhood cancer. The fund is one of the first to be supported by the Montse Benitez Foundation and representatives were at yesterday’s launch, fresh from their efforts trying to raise funds by competing in the Great North Run. Another organisation to benefit from the early work of the foundation is The Lily Centre. This is a Liverpool-based group run by women who have experienced breast cancer and now give their time to provide emotional and physical support for men and women in a friendly and informal setting. It’s a place to chat and to share experiences with others who have been through a similar situation but the group don’t receive any form of funding other than what they can raise themselves. Montse is president of the group, having first come into contact with it following her aunt’s diagnosis with breast cancer. Fernando Torres may have raised Liverpool £50m when he went to Chelsea but back when he was still loved at Anfield a shirt of his was donated to help the Lily Centre raise funds – it raised just under £5000, a massive amount for the centre. It’s Rafa’s name that will undoubtedly help raise most awareness but to raise funds a number of different events are planned. Travelling around Liverpool it would be difficult not to be aware of the forthcoming night at the Empire Theatre, “An Audience with Rafa Benitez“. Billboards have Rafa looking out (one of them even overlooks the back of The Kop) alongside the message, “Get into the mind of Rafa Benitez”. That chance comes on October 16th and tickets are selling fast. Montse also said there will be Winter Golf events which she said should be fun and for which the participants needn’t worry if they aren’t up to “Tiger Woods standard”. More leisurely still will be the Ladies Lunches each month, the first of which is in Hope Street’s London Carriage works in November. Hog roasts and barbecues are promised for next summer. With the launch coinciding with the Labour Party Conference elsewhere in the city and discrete signs about tightened security placed on the hotel’s reception desk there may have been a moment of concern for late–arriving guests. Around half a dozen uniformed police officers were in amongst the throng of guests but they weren’t there to stop trouble. They’d come from across the water to help publicise their own efforts to help with the foundation. Officers from Heswall Police station will be doing a London–Paris bike run starting on Monday with funds raised through sponsorship going to the foundation. Despite the claims to contrary Rafa Benítez is still a popular figure amongst Liverpool supporters and for many is considered to be “one of us”. He no longer manages the club but the affection for him and his family is strong and no doubt mutual. The amount of goodwill they will attract should ensure that the foundation is a resounding success. Rafa, u have done a lot for lfc. We hope u will be given a chance to coach lfc again if kenny and steve fail. All the best, ynwa! No matter what your opinions on his managerial reign, his support for liverpool (the club and the area) is clear and he is clearly a decent person and the cause is a good one, the empire show will be intriguing. Let’s get rid of this Dalglish fella & bring Rafa back right now. Ther’s far too much harnony around the club at the moment. I wondered when you’d show up again “Todd”. Rafa will always be remembered fondly by a lot of LFC fans. He nearly won us th PL Cup 2008/9, coming out second with little spending on players. It was so close. He single-handedly stood up against the might of former owners Hicks and Gillett and even eventually went against Chistian Purslow, the trio that nearly bankrupted LFC. He donated personally to HFSG. Now with Montse’s charity, he hopes to contribute more to Liverpool. Absolute marvel of a man! Great man and great manager. The clowns who got rid of him showed their football acumen by appointing Hodgson for God’s sake! We took CL football every season for granted under Rafa, had great European nights and our best ever PL points performances – not to mention a few trophies. “Not good enough” for some – even with the new found wealth of City and Spurs to compete with. Now getting into CL is something we can only aspire to (LOL) and I doubt we will see LFC in a CL final again for many a long year. Best manager we have had since the glory days and a real tragedy for me that he left. With FSG backing him we would be genuine PL contenders. Hope he can return one day.